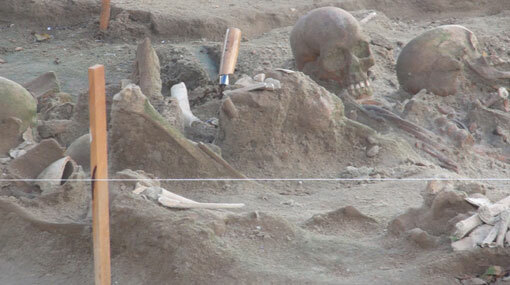 The excavations at the mass grave, which was discovered near the old CWE (Sathosa) building in Mannar, have unearthed skeletal remains belonging to 266 individuals as of today (06), according to the Judicial Medical Officer in charge of the inspection Dr S. Rajapaksa. Out of this total, skeletal remains belonging to 258 individuals have been systematically removed through excavations and currently placed at the Mannar Magistrate’s Court complex, Dr Rajapaksa said. These skeletal remains will be sent to a lab in the California, United States for radiocarbon dating, he further said. Under the first and the second phases of excavations, soil mounds have been removed from the site, however, the perimeters of the excavation site would have to be expanded, he said. The excavation process was launched under the orders of Mannar Magistrate A.G. Alexraja, following the submissions made by Mannar police. According to Prof. Somadeva, the age estimation of the skeletal remains is not yet determined.